The Sony A6500 utilises the same 4D FOCUS system a Fast Hybrid AF system that combines high-speed phase detection AF with extremely accurate contrast AF and allows it to capture and lock on to moving subjects in as little as 0.05 seconds as the A6300. It also features 425 phase detection AF points and High-density Tracking AF Technology, and, thanks to faster internal processing capabilities, has a maximum buffer for high-speed continuous shooting of 307 frames. The A6500 is the first Sony APS-C sensor camera to feature 5-axis image stabilisation, which provides a shutter speed advantage of 5 steps, ensuring the full resolving power of the sensor can be realised, even in challenging lighting. It also works with a variety of lenses, including E-mount lenses without OSS and A-mount lenses when used with a compatible mount adapter. When an E-mount lens with OSS is mounted, pitch and yaw are compensated in the lens and horizontal, vertical and roll axes are compensated in the camera body, resulting in optimal 5-axis stabilisation. The new A6500 comes equipped with touch screen functionality, allowing users to lock focus on a subject simply by touching it on the screen. Additionally, in a first for Sony cameras, the A6500 features touchpad functionality. When utilising the viewfinder for framing and shooting, the LCD screen can be used as a touch pad. Simply drag a finger across the screen to shift the focus point from one area to another. 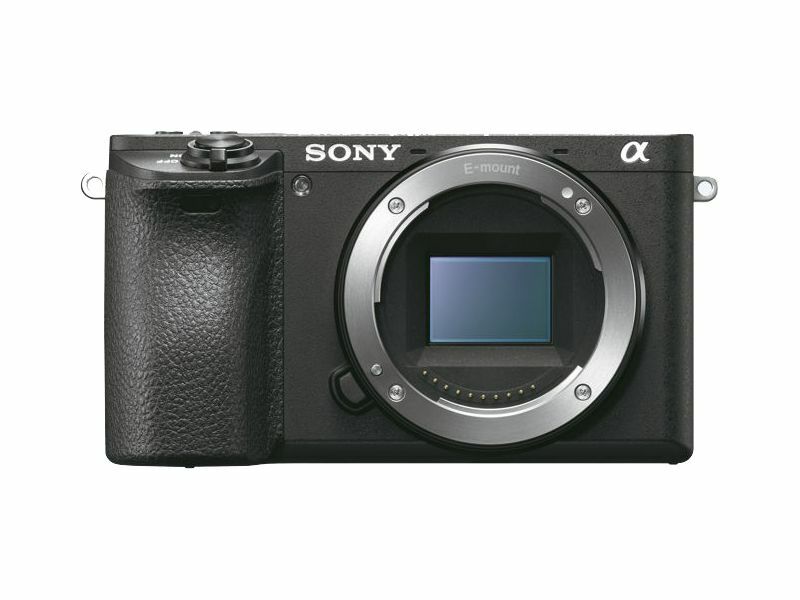 The A6500’s APS-C sized 24.2 MP Exmor CMOS sensor works together with a BIONZ X image processor to maximise processing power and achieve an impressive sensitivity range of ISO 100-51200. The BIONZ X image processor and newly developed front-end LSI ensure superior image and video quality with low noise even when using higher ISO settings, in particular those at high sensitivity values where other cameras typically struggle. The LSI is also responsible for the expanded buffer depth for continuous shooting. Able to shoot 4K (3840x2160p) video in the popular Super 35mm format on the full width of the image sensor, the A6500 uses full pixel readout without pixel binning to collect 6K of information approximately 2.4x (20 MP equivalent) as many pixels as 4K UHD and then oversamples the information to produce high quality 4K footage with exceptional detail and depth. Thanks to its Fast Hybrid AF system, the A6500 focuses exceptionally fast during move shooting, and offers touch focusing as well as adjustable AF transition speed and AF tracking sensitivity. The camera supports the XAVC S codec during video shooting, which records at a high bit rate of up to 100 Mbps during 4K recording and 50 Mbps during Full HD shooting, ensuring maximum detail and clarity in both video formats. It can also record Full HD at 100fps at up to 100 Mbps, which allows footage to be reviewed and eventually edited into 4x slow motion video files in Full HD (25p) resolution with AF tracking. The A6500 incorporates a ‘Slow and Quick’ (S&Q) mode that supports both slow motion and quick motion. In this mode, frame rates from 1 fps to 100fps can be selected in 8 steps for up to 50x quick motion and 4x slow motion recording. It also offers S-Log gamma recording for wide dynamic range shooting approximately 14-stop latitude in S-Log3 gamma setting and supports S-Gamut for a wider colour space. Both options allow for greater creativity for processing video post-production. With its refined design, the A6500 maintains the mobility of the A6000 series whilst adapting much of the usability of the A7 II series. It features the same high contrast, high resolution 2.4 million dot XGA OLED Tru-Finder EVF as the A6300. New features include a magnesium alloy body, a high-durability shutter with a tested life span of approximately 200,000 release cycles, a robust lens mount, a recessed grip to improve handling, a larger release button and ten total custom buttons including ‘C1’, ‘C2’ and ‘C3’. It also has an improved operation feel for its mode and control dials and rear face buttons, as well as a softer eyepiece cup for more comfortable usage. It has WiFi, QR, and NFC functionality, is fully compatible with Sony’s PlayMemories Mobile applications for Android and iOS platforms, and offers location data acquisition via a Bluetooth connection to a compatible mobile device.